Roger Federer said on Tuesday his decision to end a 20-year association with Nike and embark on a new chapter with Uniqlo was influenced by the Japanese clothing company's commitment to stay with him long after his playing days are over. 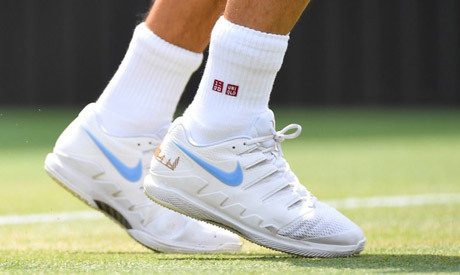 The 37-year-old, who has won a record 20 Grand Slam singles titles, signaled the end of his association with Nike in July when he walked out onto Wimbledon’s Centre Court dressed in Uniqlo apparel. Federer said the belief shown in him by Uniqlo's CEO Tadashi Yanai and Executive Creative Director John Jay had been key. "John Jay in New York, where I had an event there, said it very nicely: 'One day I will retire from tennis but I will not retire from life,'" said Federer, who was presented as Uniqlo's new global brand ambassador. "Life will go on and Uniqlo and Mr. Yanai believed in me very strongly as being very important to their brand, even though maybe my playing days are going to come to an end at some point." One of Federer's goals after he retires is to develop the charity work started through his foundation, which aims to empower children in poverty through education, and he said Uniqlo shared that vision. Federer's switch to Uniqlo comes at a boom time for Japanese tennis after Naomi Osaka claimed the country’s first Grand Slam singles title at the U.S. Open last month. "I think winning Indian Wells helped her to believe that she could also win another big title,” said Federer, who is planning an exhibition match in Japan next year. "She succeeded in both of them and that shows a winner's mentality."